The submissions are defintly picking up, I’m seeing more submissions than before. Why? I attribute this to the start of the new year when many folks change up jobs, and the slight uptick we’re starting to see in the economy. Congrats to Jeannette Gibson (Twttier) who has moved to corporate marketing to run social media at Cisco Systems. I’ve shared the stage with her a few times, she’s quite impressive, and has been successful in deploying social programs in B2B environments. Dave Armon has joined Context Optional as director of strategic accounts. Zena Weist (Twitter) has landed at HRBLock as the director of social media, congrats. Ginevra Kirkland, long term customer advocate at Six Apart (I had the joy of working with her years ago as a client) has now joined the mighty team at Get Satisfaction as a Community and Account Manager read her post, as well as read the interview on Gsat blog. Joe Stanhope joins Forrester Research (great folks) as a Senior Analyst focused on site optimization strategy, which includes coverage of Web analytics as well as online testing and targeting platforms. WPP owned agency Ogilvy PR hired Dirk Shaw as a senior vice president in its 360° Digital Influence Practice. I’ve worked closely with Dirk in the past and have been impressed, congrats Dirk and Ogilvy. As an industry watcher, I look at trends, data, spending, technologies, yet what’s really important is watching the trend of professionals as they grow into these roles managing disruptive technologies. 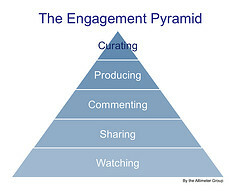 In a world of noise, curation becomes very valuable, as a result, there are very specific requirements for this list, which include: 1) You must have a public LinkedIn profile page, as this is one of the best way to verify employment. 2) The profile indicates that social media is part of your full time career and profession –not just for personal or casual use. 3) You must work at an enterprise class corporation with more than 1000 employees, 4) Must be on brand side 5) You’ll kindly leave a comment below with the submission for review. Due to excess volume, submissions by Twitter and emails or other channels will be hard to respond to, and I can’t guarantee they’ll be included, so, please leave a comment below. I’m passionate about what these folks do, as I, myself, was a strategist/community manager at an enterprise corporation a few years ago. A few weeks ago, I was invited to join a discussion with Joshua-Michéle Ross (O’Reilly ), Stowe Boyd, thought leader, and Peter Kim (former colleague at Forrester, now at Dachis Group) on the topic of social business. Listen in, as there’s not really a lot of content on the slides to focus on, while you go about your work, driving, or workout. For over a decade, with simple BBS systems to community platforms, support communities haven’t undergone much innovation. Often a silo and tucked away in a website, these communities are going to take center stage. With social technologies appearing on every webpage, and more existing systems starting to connect, expect to see interesting use cases evolve. Support focused communities will evolve to touch marketing, sales, channel partners, CRM systems, and even become a thriving platform in the next few years. Let’s explore the rapid changes coming together. Take a look at Microsoft’s media centric Channel 9, VMware communities, or even AAA’s travel tips. These branded communities are offered by companies and encourage members to self-support each other, or the company will support them directly. The members are often customers, developers, or implementation partners. It’s not limited to them alone, prospects of a company may peer in to see how vibrant –or angry–the community is. There are over 100 technology vendors offer these commodity features. Become a thriving marketplace of buyers and sellers. Not just through discussions, but through automated matching of buyers and sellers using reputation systems, and needs analysis tools. See how the concept of VRM is slowly taking hold. New forms of value from third parties will spur innovation. System integrators, consultants, and other vendors who have services to offer community members will want to offer training, webinars, or other campaigns. 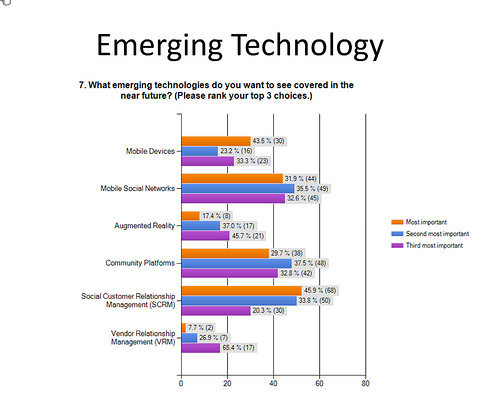 Branded communities can monetize this as an intermediary. Formalized advocacy programs will take hold beyond the organic evangelist. Some communities will offer features and programs that encourage members to join an unpaid army and reach out to prospects –and ready them to arms when the brand is under attack. Communities members will ideate and start build new products with R&D. In some cases, they may help the brand define new products and be very involved in the R&D process. Developer platform will let community create their own experience. Taking a nod from Facebook, MySpace and Twitter, someday, support communities will offer platforms that will enable the members to create new applications, tools, and even products within the context of the community. Connecting to CRM systems to offer better service. Community platforms will connect to CRM systems identify upsell, crosssell, and underserved accounts, increasing the efficiency of support. Connections to other systems yield new experiences. Support communities will no longer be a silo but will connect to brand monitoring tools. ERP systems, business intelligence systems, web analytics, and social analytics tools. The walls of support communities crumble as they connect to the public web. There are support communities in existence all around the web (see Get Satisfaction, UserVoice or even a customer created community). Expect to see branded communities tie to these off-domain systems. Leave a comment below with your idea. The opportunities are abound. Despite the many opportunities for innovation of communities, first and foremost, the sanctity of the community members must not be broken. Companies have learned, often the hard way, that the members are in charge, so this needs to be a win for them first, the company second. I plan to hold a no-fee “Community Innovation” roundtable in Q1, to ideate the evolution of the branded community beyond support. Should you be interested in attending, I look forward to hearing from you in the following web form. I’ll be extending an invite to some key thought leaders in this space, to really spur the thinking from the top minds. Forget Farmville or Mafia Wars, Microsoft wants you to play Excel –pivot tables FTW. Most software training and help resources are painful experiences written by technical publication editors. We know that most tutorial and help sections within applications are horrible to work with (I’ve shaken my head in frustration quite a few times using Microsoft’s own tutorial tools), and not every office worker can afford to attend a powerpoint training class. Click above image to see my notes: Powerpoint users are given challenges, like this artistic effect, to win points which are used to brag on Facebook. First, click on the image to see my additional notes. I rarely get excited at briefings, however big-enterprise Microsoft is doing something interesting. In an effort to make learning fun and increase usage of Microsoft office products, they’ve launched a pilot program called “Ribbon Hero” (read blog, or watch video). Much like a game you’d find on Facebook, Ribbon Hero lets users of Word, Excel, Powerpoint, and other office applications score points by unlocking challenges –then touting it to their friends. 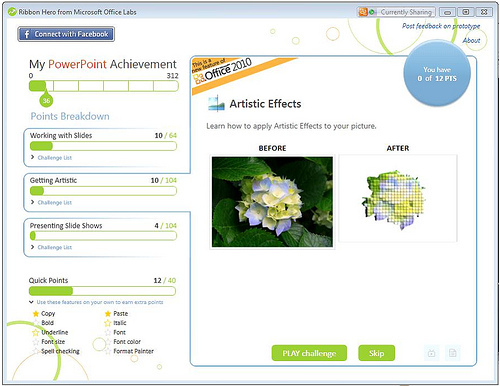 Microsoft staff creates ‘challenges’ in the software, and encourages users to play to learn. As users unlock challenges (see screenshot above) they can earn up to a max of 300 points per product, and can choose to share their scoring with their Facebook friends on the Fan page. Don’t think there’s any social captial here? well if people can brag about their fictitious mafia wars scores, we should expect them to tout their real-world workplace proficiencies. There are three four major hurdles as I see it: 1) I’m not confident that this launch will reach a wide audience in the workplace, it may skew towards Gen X and Y. 2) Secondly, they’ll need to overcome the barriers of those who score low being bashful about their scores, and not wanting to share with others. 3) It’ll take some studies to show that professionals that complete the challenges (300/300 points) are better workers, then get HR to promote, 4) Lastly, like all games, they can be cheated, like gaming hint websites, expect there to be a ‘tip blog’ for Ribbon Hero. Harness reputation points to grow the program. has just scratched the surface in using this reputation data like they have with the Microsoft MVP advocacy program to create a non-paid growing army of Microsoft Office experts. Add features to enable game to scale. 1) Q&A features that allows members to pose questions to each other and answering them, gaining more points, 2) Challenges to be created by the members themselves, growing the game at a scalable pace for high achievers. Never letting the game end. Develop a global leaderboard of top users. Allow them to build profiles as true ‘Office Heros’ and how they succeed at their job on a separate website, and encourage them to share their achievements on their blogs, resume and LinkedIn pages. Measure based on new benchmarks. 1) Top line adoption curves skew up 2) Reliance on existing support features goes down 3) Ten solid case studies of people getting new jobs or promotions in part because of their proficiency at the game. I’m sure we’ll hear more about this from Microsoft –and maybe other traditional enterprise software companies like IBM, Oracle, and social fearful, Apple, will follow suit. I gotta hand it to Microsoft on this one, they’re finally making work fun. Lastly, ya know I gotta ask, but will Clippy make a cameo in the game? Disclosure: Microsoft is an Altimeter client. We want you to trust us more by being upfront about our relationships, read our disclosure policy. For the third year running (see 2008, 2009) I’m going to aggregate stats in the social networking space on a single blog post, and update it through the year. Data fiends should bookmark this post for future reference. I’ll be updating this post throughout the year, bookmark it, and share it with others. Japan: This slideshare has data on Japan’s mobile behaviors, and demonstrates how most social networks are accessed through mobile devices, and discusses Twitter, Facebook, and other social network adoption. Japan’s Cellphone Edge, 2010. Facebook has announced 400mm users, Feb 5, 2010. Hubspot luanches a report of Twitter.com registrations and shows a decrease in rate of adoption. There’s also useful data within the report about followers and their behaviors based on a sample methodology. Hubspot, Jan 19, 2010. Sysmos launched a report about global usage of Twitter, with most adoption in US. Interesting that the key nugget is “… the number of U.S. unique users was 50.8%, a sharp drop from 62.1% in June. This suggests the use of Twitter outside the U.S. has experienced significant growth over the past six months.”, Jan 14th, Sysmos. Thanks Jean in the comments for the submission. I’ll continue to update this page over time, please leave a comment if you have 2010 submissions, I’ll credit you. From an industry perspective there were significantly more hires this month, than last. This is due to two pieces: 1) It’s traditional for new roles to be filled during the new year, 2) An uptick in the overall financial space and a continued focus on the social and open web. Chris Messina who’s been a leader in the open web and standards joins Google, where he’ll be focused on leading the open web initiatives. I’m certainly going to be following his work regardless of where he goes. Joseph Smarr, via product team at Comcast’s Plaxo also joins Google, both of these gentleman have a focus on web standards and the ‘Openstack’ so it’ll be interesting to see how this unfold. I’ve been friends with Joseph for a few years now, and it’s great to see him continue to grow. BL Ochman, a force of great positive energy who I’ve known for over 5 years, has joined Proof Digital Media – the new digital marketing arm of Burson-Marsteller. She’ll report to Proof CEO Jay Leveton, and have been given the opportunity to help guide the agency into the forefront of new media agency. Johannes Neuer joins the The New York Public Library as the eCommunications Manager where he’ll expand and promote eCommunications and social media initiatives at The New York Public Library (both internally and externally). Kati Driscoll lands at AAA Mid-Atlantic as a Social Media Community Specialist	Working within existing and emerging AAA Mid-Atlantic communities to engage members, providing information and conversation to help them receive the full benefit of their membership and our community. Karthik S joins Edelman as Head of Digital Strategy (India) Create and frame Edelman’s social media PR offerings in India, help clients integrate social media and digital communications within existing PR programs. Greg Meyer joins Gist Customer Experience Manager where he’ll be providing VIP Support, Building a Customer “Power Tips” channel, and generally doing whatever necessary to make users successful. Jennifer Polk has been promoted at Sears Holdings as the Director, BU Social Strategy	Developing and leading community and social networking initiatives for SHC BUs, including building strategies and programs to help the BUs achieve greater customer engagement. She’ll be ensuring social programs align with BU business objectives and promoting partnership between Social Media, Online, Marketing and the BUs. Robert Lommers has been promoted at Rabobank as the online media specialist focused on social media, online media, mobile, webcare, and social networking. Joel Burslem is now with 1000watt Consulting as Associate of Social media marketing and strategy for the real estate industry. Shara Karasic has been hired at Appolicious as the Director of Social Strategy developing community engagement and managing social strategy. Judith A. Mod is at Social Gastronomy as a Principal where she’ll be focused on enabling organizations to leverage social media for marketing, customer relationships, operations, employee engagement, and partner management. Matthew Rosenhaft	also joins Social Gastronomy as a Principal where he’ll enable organizations to leverage social media for marketing, customer relationships, operations, employee engagement, and partner management. Eileen O’Brien	joins Siren Interactive as the Director, Search & Innovation at a social media lead for agency’ clients. Paul Miser has been promoted at VML Senior Social Marketing Strategist where he’ll be creating dynamic Social and Mobile strategies for VML clients as they tie in with their digital and interactive strategies. Kurt Abrahamson joins SocialMedia.com as the CEO, Leading the SocialMedia.com team to deliver our new social advertising platform for publishers. Heather Strout	joins the Farland Group as a Director of Community Services, there Heather will be helping companies discover ways to establish and sustain customer communities. She comes from a great family, her brother Aaron is a friend and constituent. Ari Lightman has a teaching appointment at Carnegie Mellon University as an Adjunct Professor teaching a case study class on measurement and analysis of social media initiatives. Above: A photo I took on a recent trip to North Shore Oahu, inline with my plans to fulfill operation bluewater. Recent data around interactive marketing spend indicates that the hospitality industry was ripe for spending on social marketing above all other industries. Why? This form of consumer marketing could be dependent on the human emotion and story telling between individuals, or through compelling word of mouth marketing campaigns. As a result, Christine Tran, Altimeter Researcher and myself are kicking off this list, and encourage you to add examples by leaving a comment. The scope for this is list is a tourist destination –not a hotel, airline, or specific restaurant. This video contest campaign encouraged filmmakers in the UK to submit videos with voting encouraged from the crowd. YouTube, Facebook, Twitter are present on the main site, but yet each of their other travel, blog, and other sites. See Carribean Travel, OneCarribean lists out various social properties, Antigua’s forums, and Aruba’s Facebook integration. Site has flickr, YouTube, podcasts and Twitter integration. They also sport a Facebook page. Hawaii has used a variety of assets such as Facebook pages, Twitter, and even created a Pandora station, in the past, Hawaii has catered to a group of bloggers who spread the word to their readers on a blogger tour. Disclosure: HVCB is an Altimeter client. I recently met the wonderful head of social media, Kerry, at Memphis’s travel bureau on my travels, they have Facebook, Twitter, and Flickr account links on their site but haven’t yet integrated with their site. An online source for an insider’s view of Philadelphia.” It’s a blog written by staff and local bloggers who are “in-the-know.” Here’s an example of their blog on dining. You may have heard of the Best Job in the World campaign, a popular campaign garnering international media attention, and over 35,000 entries worldwide on youtube. The winner blogged about his entire experience. On the heels of the Best Job in the World, Thailand launched its own campaign. Contestants produced a 60-second YouTube video, and rallied for votes from their own existing social networks, effectively becoming destination ambassadors and spreading engagement. Do see the related blog. If you’ve got examples, please leave a comment below, with a description and URL, we’ll add. 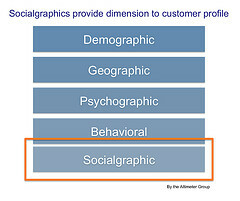 Social CRM: An organization’s response to the fleeting customer in the social space, and how companies must provide a holistic experience to customers by creating processes, integrating new channels, and responding to customers in near-real time. Why this space? Most companies don’t know they need it, but as customers increase their social behavior, tacking, managing, and responding will become increasingly difficult. I’ve already blogged some of my findings, read all the posts tagged ’social crm’. We’re just a few days from Y2K+10, ten years after the big scare of the whole world collapsing from a lapse in computer programming foresight. I remember it closely, I spent a few hours in the later part of Dec 1999 backing up data at the small business my wife was working at. We were able to download nearly all of her company’s (a very small office) data onto just over a dozen zip drives, remember those? Funny that we could fit nearly all the digital files onto those drives –perhaps, if Y2K fears were to happen, it’s better than uploading to the cloud. I also remember an army of Y2K consultants, and their concerns over liabilities, appear marketing how they’d offer CIOs Y2K enterprise proofing for companies that were concerned about losing all their data. I even had one slightly off-keel friend stay home on NYE 2000 eve with a gun in hand, military rations beside his bed. I wasn’t phased, I enjoyed reveling in downtown San Francisco with friends. I want you to reminisce, do you remember what you did to protect your personal data, finances, work data, or what your company did in preparation for the Y2K apocalypse? Leave a comment, share with others, and take a look back 10 years ago. To trigger some memories, here’s a video to remind you of the fear, oh Leonard, really? Illogical.